Welcome To Newman Trucking, Inc! 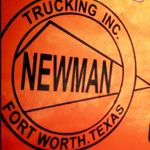 Established in 1987, Newman Trucking, Inc. has provided safety and promptness for shipments throughout the US. Specializing in Military rail shipments, we are A.A.R. Open top certified and have the ability to meet your needs in shipping via rail. We are based out of Fort Worth, TX and have experienced employees that are able to travel wherever we are needed. We are able to keep up with the changing rail industry's securement requirements, so feel free to contact us anytime we can help.